A couple of years ago, I attended an Arts Integration Day at Plymouth State University. There, I presented a hands-on workshop on Building Community through Music. But before the workshops began, all the attendees and presenters were treated to a wonderful keynote speaker and a performance by TIGER: (Theater Integrating Guidance, Education, and Responsibility), a professional theatre company that writes and performs wonderful performances that raise awareness and promote positive thinking and behaviors around topics that concern children. I witnessed the “Green TIGERRRR” and was wowed by the enthusiasm, music, script and overall performance. Well, fast forward to last month, our fourth grade team found ourselves in quite a predicament – we had money to spend from our PTA and this money was intended for school programs. I was happy to suggest that TIGER come to visit our school and after perusing their repertoire, found one on bullying: “A Bully Isn’t Your Friend…Yet!” My team agreed and we booked it. 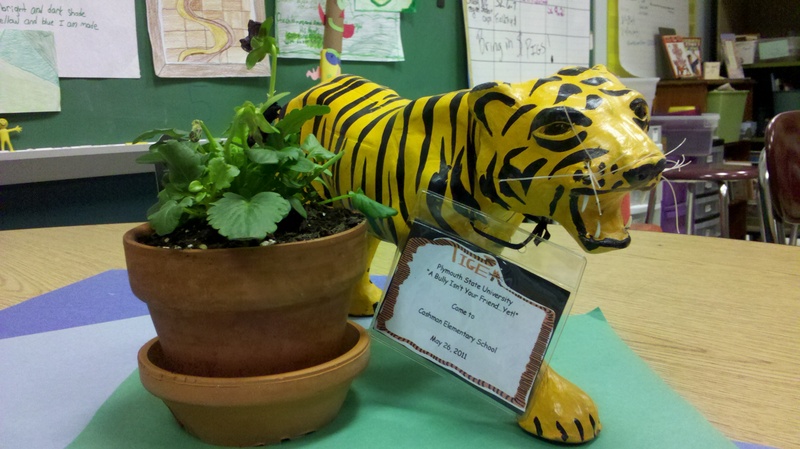 Last week TIGER came and put on yet another great performance for our 2nd, 3rd and 4th graders. Based entirely upon the anonymous writings of New Hampshire school children, a TIGER performance incorporates live actors, puppets, theatre, movement, and music to engage school audiences from K-8. By using childrens’ own words, TIGER enables children to hear their own voices as they step back from the experiences of bullying and the intolerance of individual differences to move into more positive social interactions at school and in their community. They take each letter of the word TIGER and create vignettes around a theme so that students come away with a positive and memorable message. For this TIGER performance, T=Tell and adult, I=I can say no, G=don’t Gossip, E=Exit when necessary, R=Respect. One very poignant moment, and a tribute to the company, was when in the performance, the actors were portraying a bus scene where Ernie was an outcast and was being bullyed by all the other students and seemingly even the impatient and enabling bus driver. Ernie couldn’t find a seat and was not welcomed by anyone on the bus. He was made fun of, laughed at and ridiculed. There he stood, with his backback over his shoulder about to cry. All 350 students were silent. The teachers were too. My own eyes started to fill up. We all wondered, “What is going to happen?” In that moment, TIGER created the raw and uncomfortable emotion that is really felt in that type of situation. Finally, Gladys got up and sat with someone else so that Ernie could sit. You could hear a pin drop. Then, in the goofy TIGER fashion of Ralph, the bus driver, the bus was driven off in a crazy, curvy, bumpy bus drive making the entire room roar in laughter. At the end of the performance, our principal was gifted with a TIGER to keep in our school. She then gave it first to my class so that we could start the tradition of passing it from room to room in a reminder of what we learned that day. The performance for me was yet another reminder of how important and powerful the arts can be. With this, the TIGER performance created a safe place for students to watch and reflect on the hard issue of bullying. Certainly with the visualization, the music and the words, each person there was touched by an important message. It’s my hope that some part of this performance sticks with our students and teachers, helping them to be more aware and proactive. Please watch my animoto of pictures taken during our school’s performance.